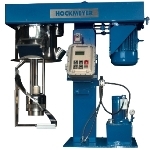 Multi-shaft mixers supplied by Hockmeyer feature a helical or anchor sweep low speed blade and an additional high speed shaft. The low speed blade feeds the high speed blade by folding and mixing the mass in the vessel and enhances product uniformity by scraping the walls. 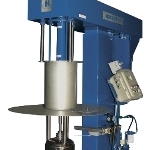 The high speed blade provides high shear to dissolve or disperse ingredients. 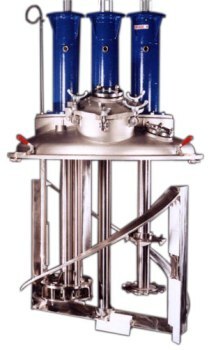 Multi-shaft mixers are commonly used for mixing medium to high viscosity products. 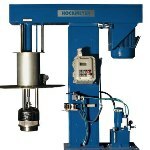 Since a high speed disperser has a restricted zone of influence in viscous products, the low speed blade is necessary to obtain a uniform mixture. When fitted with scrapers, the low speed blade also helps in transferring heat to an external jacket. 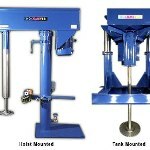 Multi-shaft mixers are available in three models, such as dual shaft, triple shaft, and concentric shaft. Sizes from laboratory units to 3500 gallons.